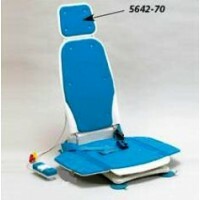 Bath Lifts / Chairs There are	5 products. Bath lifts make bathing an enjoyable and safe experience. Taking a bath can be difficult when you are physically challenged. A bath lift can give you peace of mind and make taking a bath enjoyable. Caregivers can also strain themselves lifting patients into and out of a bathtub. The solution is to get a lift. Bath lifts remove many of the risks associated with bathing. 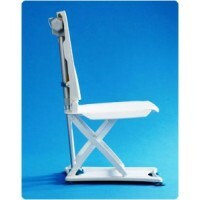 Bath lifts are battery operated chairs secured to the bathtub's bottom. With the flick of a switch or the press of a button, you can lower or raise the bath lift with ease. You or your patient simply slides onto the lift and is lowered into the bathtub. When the bath is done, raise the bath lift to leave the bathtub. This makes it possible to enjoy bathing without bending, slipping, or falling. Some lifts, including The Bathmaster Sonaris Reclining Bath Lift, warn you when battery power is low. This protects you from being stuck in your bathtub because of a dead battery. It also has a safety mechanism that prevents the bath lift from being lowered if there's not enough power to raise it up again. Most bath lifts are made of durable plastic and are easy to assemble and install. There is no need to drill holes in your bathtub because the bath lifts are attached using suction cups. Some lifts have size restrictions, so before buying a bath lift make sure to check its weight limitations. A typical bath lift can hold up to 300 pounds. In addition to the physically challenged, those in good health can benefit from bath lifts. Anyone can slip and fall while getting into and out of their bathtub, so a bath lift can be useful no matter what your age or physical condition. Put your safety first; purchase a new bath lift from MedSource USA today. Order conveniently online or by phone or fax. If you need more information, call us toll free at 1-866-921-0390. We will be glad to help you.